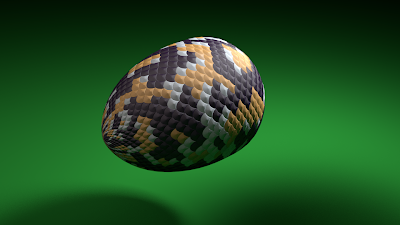 The second OSL shader I have implemented for Blender is a scales pattern. It provides an overlapping pattern of semicircles that can be used for things like fish scales or roof shingles. Like the hexagon shader this is a generic shader, i.e. a shader that provides a color pattern irrespective of lighting conditions so it is possible to use it in different contexts. 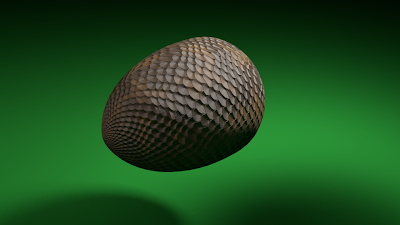 In the code shown below the shader is defined with two input colors, coordinates (typicallt uv-coordinates of the object) and a parameter called n which can be used to alter the shape of the scales. Beside a color and an index we provide an output for the distance to the center of a scale (which can be used for nice displacement effects) and a vector Vindex which is unique for each scale but the same within the scale. This can be plugged into a texture to provide each individual scale with its own distinct color. In the example noodle for the image shown at the beginning you can see how this is done. The next shader I will implement I think, will be an irridescence shader so we can all enjoy some soap bubbles.